Bon Eats: Night It Up! Curry fish balls. Siu mai. Meat skewers. Pan-fried meat pancakes. The stench of stinky tofu. 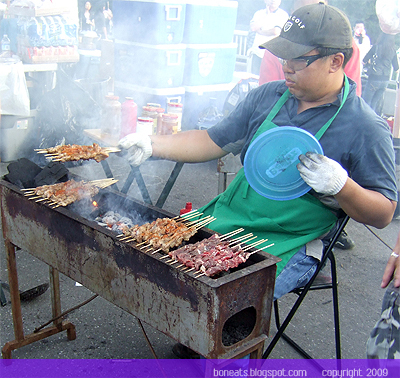 These are some of the memories that come to my mind when I think of an Asian night market. These night markets are a common scene in Asian—in Taiwan, Beijing, Japan, Malaysia and Singapore. They’re loud. They’re crowded. They’re hot. They’re smelly. But hell, they’re a LOT of fun. So when I heard of Night It Up! 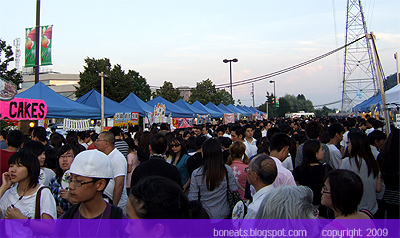 (what was once known as Toronto Night Market), I knew that I would be there, no matter what. The festival is a yearly event, organized by the Power Unit Youth Committee. The event is a great way to bring the community together, bask in Asian pride, listen to great music, buy Asian paraphernalia, and more importantly, eat a lot of great Asian street food. I’m a huge sucker for street food, not only because it’s usually fairly cheap, but because of the enormous variety Asian street food has to offer, versus the North American chip wagon and street meat. There’s the savoury, the spicy, the smelly, the sweet; hot or cold—there’s something for just about everyone. 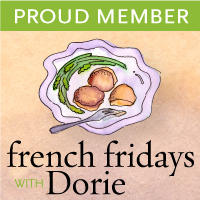 It also makes for an exciting epicurean experience; just grab a group of friends and start trying out all the various dishes. I met up with my friend at Metro Square right at 7, and the place was already filled with people, with line ups at the smelly tofu and takoyaki stands, and it only got busier as the night wore on. Must tries included takoyaki, Xinjiang-style meat skewers, fresh oysters from Diana’s Seafood, basil seed drink, Malaysian murtabak, and the always popular (and always smelly) stinky tofu. For those who have never experienced a night market before, the sights and sounds may be a little overwhelming at first. The best strategy is to just walk around and see what’s available before breaking off and start lining up for food. 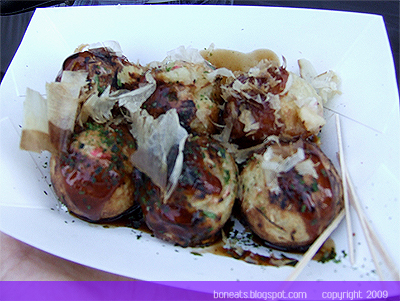 There were a few stands making takoyaki that evening, but we decided to hit up the one farthest from the entrance, right because the Taiwenese omelette stand. 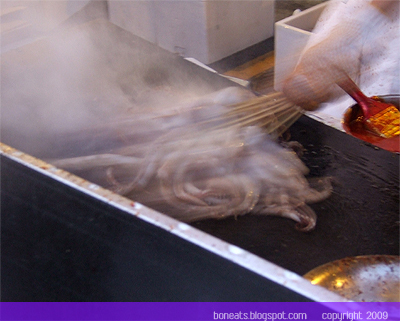 They were piping out, fresh off the griddle, topped with a delicious sauce and bonito flakes. The addition of pickled ginger along with lettuce and tender pieces of octopus inside gives these takoyaki a nice acidic kick, which I really enjoyed. Burned my mouth in the process of eating them, but they were so good! We then took a quick break by browsing some of the clothing and paraphernalia stalls, making a pit stop at the Turtle & Hamster stall (as my friend jokingly mentioned, “Not for eating! !”) to gush over the cute hamsters and stopping by the Creative Zing stall to buy some awesome buttons. 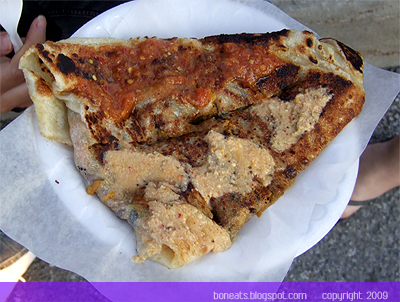 That brought us to the nearby Malaysian murtabak stand, which I can best describe as something like a stuffed roti. We went the vegetarian route, and slathered our murtabak with hot sauce on one side (my mouth was on fire!) and coconut sauce on the other. Deciding to take a little break from the crowds, we sat on a curb (pseudo-“hut-yee”-style) and dug in. Needless to say, it was delicious, and gone in a jiffy. 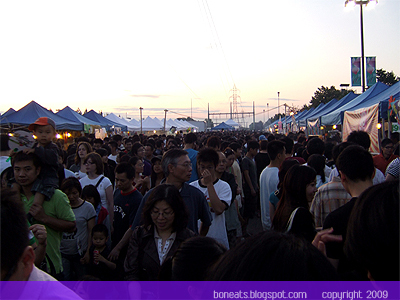 As we slowly fought through our way through the growing crowd, we stopped some more to ogle at cute Asian accessories and see what all the fuss was at various food stands before reaching our starting point: the smelly tofu stand. And oh my god, the line was out of this world. The line for one stall was already doing a U-ee, while the other one kind of disappeared into oblivion (aka I couldn’t see where it ended). My friend and I shared a look, and knew that neither of us, despite wanting to try smelly tofu, had any patience left in us to wait in line. So we gave up our quest for tofu, and I got grilled octopus instead, a worthy consolation prize. These were so incredibly tender and beautifully spiced—probably one of my favourite snacks of the evening. Kudos to the Power Up Youth Organization, and a HUGE thank you to everyone who made this event possible. It brought back wonderful memories for me, and it’ll be a festival that I’ll continue to come back year after year. This is a free event worth checking out next year, Asian or not. You’re bound to excite your tastebuds with the delicious food, and experience a piece of Asian culture! Posted by Bonita at 12:07 a.m.